so the race that I couldn’t make up my mind about? It was this morning. Once the forecast changed from rain, I decided why not? I’ve run a longer distance with less mileage under me, and I finished. It might not be pretty, but I could finish this. And if it was awful? Well a DNF isn’t the end of the world. The course was pretty much the same as April’s Run to Breathe with the initial mile coming around from the west side. Again it took about 15 minutes to cross the start. I was glad for that as the portapotties were a fair hike from the start. Got back to my corral with plenty of time to spare and found myself restless. After finally deciding to do this, I wanted to GO. I went out too quickly, but not as bad as Thursday and I felt comfortable. I like starting on the west side, gives you a left turn fairly on vs. interminable straightaways. As soon as I made the left up east drive though, I was dreading Cat Hill. I think it’s because it’s named – seems worse than the rolling hills by the reservoir. But I got up it without walking and even passed a few people. I love when people are memorable. That was pretty easy today with some of the outfits, but in my pace-ish were a woman carrying a flag and another with an elaborate sign on her back. If I could keep them in sight, I was keeping a steady pace. Thing I noticed today since it was a little easier than the earlier runs where I felt relaxed enough to look around-speedy passers. At first I thought it was weird, then realized it was likely folks who’d stopped to use the toilet and then were catching up. I felt good even though it felt as if the 102nd St. Transverse was never going to come. When it did, I was grateful. It brought some shade. Although it wasn’t that warm, it was warm in the sun and the shade was a nice respite.That also brought mile three and I knew I was more than halfway done. I never considered not finishing once there, but home stretch was nice. Mile 3-4 seemed to go forever though, I partially blame the rolling hills. Because I was less extreme back of the back (out of 7,526 finishers I was 7,150) and because I had somewhat more zip in me, I found myself moving around folks more. This likely led to the discrepancy between the official results and my watch – more on that later. I was smiling come mile four, and I was trying to ignore my watch. I was creeping close to 13:00 pace average and wanted to stay under. Why at such a distance? Who knows. Humans are weird. When I made the final left turn I pushed it. The finish line was further than I thought, but I didn’t care. I had gas left and wanted to sprint-ish. I’m a goofball, I don’t care. Photo booth and flavor ice at the finish festival with band playing 80s was a great way to unwind. I finished, I didn’t walk other than at water stations and I came away smiling. Win! I’m feeling a lot better about next Saturday’s 10K. I felt like I had more in the tank today although I made the mistake of sitting at the finish line festival and I stiffened up nicely. The walk home was rather gimpy. So results. My watch and NYRR’s site are way off. I think some of it is the zig zagging because the times are in sync. 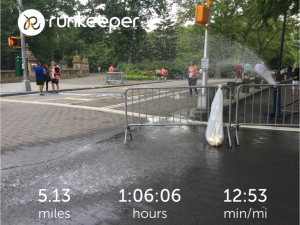 By my watch I finished in 1:06:06 and by NYRR I finished in 1:06:02. Watch pace is 12:53 and NYRR is 13:13. Since I’ve done all my spreadsheet tracking using my clock, I’m sticking with that. That said, NYRR data is fantastic. I need to learn how to interpret some of it better but here is the info for the 4m and 5m since the course is so similar (10K had the Harlem Hills). In watch time? 4.11 / :55:56 for 13:37 vs. 5.13 / 1:06:06 for 12:53. 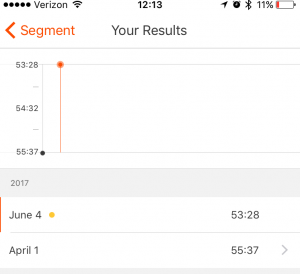 It was nice to see Strava tell me that too before I went back to look at my spreadsheet. Two minutes off over four miles was a nice thing to realize as I still try to work through Thursday’s race. 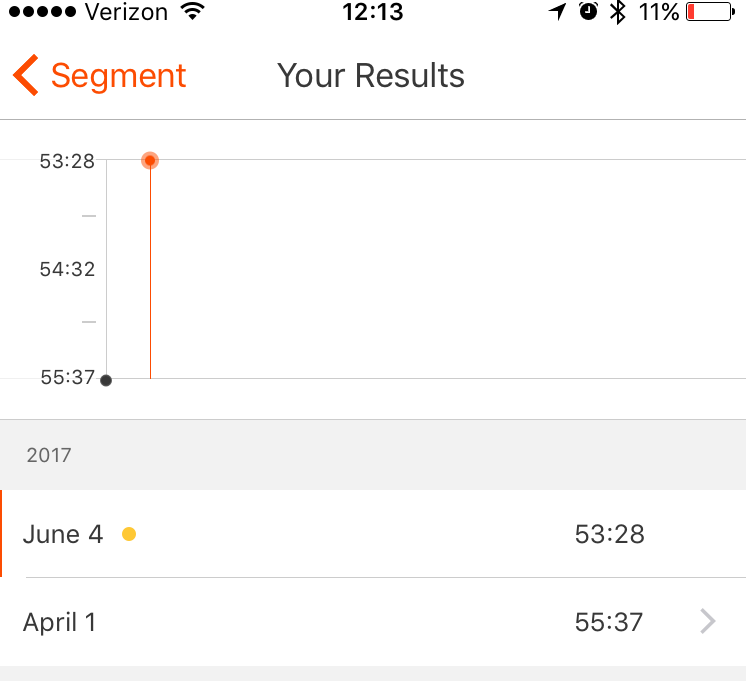 Strava also tells me I set a 5K PR, but I’m ignoring that as Runkeeper doesn’t seem to recognize it, and not sure how Strava calculated that since it doesn’t click through like the 4m does below. But 39:43 is nice if legit. While my spreadsheet is fun and handy, curious to see how the new Athlinks tracks time across races as I (hopefully) progress. I really need to get out there and do Cat Hill repeats. I dread it every time. I can get up it without walking, but it isn’t pretty. I need to buy clip ons. Having to decide between sunglasses or not isn’t going to work for summer and has driven me nuts the last three runs. I need to learn to drink and run. Stop beating myself up. I’ve said that for years over #GoTheDist, one day I’ll listen. The more you do hills, the more you CAN do hills. Which is annoying, I know! On the runs I lead, I don’t allow “I can’t” or “Sorry” when it’s an apology for being slow. It does help to ban those words! You’re doing SO well! Thanks! Mom was a school principal and they used to have funerals for “I can’t”. Sometimes I think that works for grown ups too. Had a post a while ago called “I ran away from I can’t”. It’s a useful reminder and plays well with the GoTheDist challenge on which I quit one year and learned from ever since.